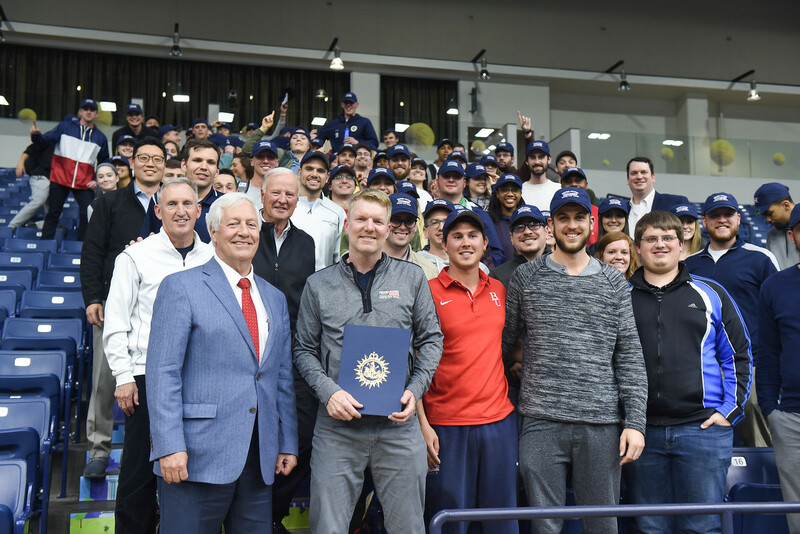 Students from Belmont’s graduate sports administration program along with undergraduate students in a sports public relations course were invited to the Curb Event Center Monday night for a panel discussion on the upcoming Davis Cup Quarterfinal event being held on campus April 6-8. To open the evening, Assistant Professor of Sport Science Dr. Ted Peetz emceed a panel discussion featuring USTA Managing Director of Major Events J. Wayne Richmond, Belmont President Dr. Bob Fisher and Belmont Men’s Basketball Head Coach Rick Byrd. Davis Cup panel including (l-r) J. Wayne Richmond, Coach Rick Byrd, Dr. Bob Fisher and Dr. Ted Peetz at Belmont University Nashville, Tennessee, April 2, 2018. After tracing his career through positions with Converse, Adidas, the ATP and USTA, Richmond advised the students of an important lesson he’s learned along the way: “If you’re going to work in the sports business, always bring free stuff.” He then handed out Davis Cup hats to the students in attendance who could answer Davis Cup trivia, later providing hats for all in attendance. Coach Byrd and Dr. Fisher then shared the story of how Davis Cup came to Belmont, following a phone call from Richmond to determine if the weekend was available and if the tennis court would fit in the arena. Byrd, a fan of tennis himself, quickly measured the arena floor to see if the Curb Event Center could qualify as a Davis Cup site, and Dr. Fisher was quick to affirm the idea. As the students began to ask their own questions about the event, a surprise guest arrived to join the festivities. Jim Courier, Team USA Davis Cup Captain, is former world No. 1 professional tennis player who won four Grand Slam titles during his career. When asked about the most memorable match of his career, Courier recounted the one he said changed the course of his life, winning his first Grand Slam title at the 1991 French Open where he played a tough five-set match against his former tennis academy roommate, Andre Agassi. Below is a time lapse video of the Davis Cup Court being constructed inside the Curb Event Center. The Davis Cup Quarterfinal by BNP Paribas begins Friday, April 6 at 4 p.m. Tickets are available at usta.com/daviscup.